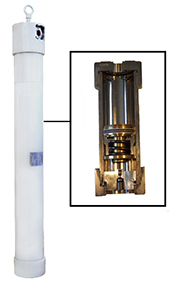 Hydro-pneumatic accumulators are devices which are capable to accumulate or release energy through oil under pressure. TheY are usually used as energy reserves or as a throbbing absorber. Piston accumulators exert superiority in comparison to other technologies available on the market due to its adaptability. They can be employed in all positions and are insensitive to movements, shocks, or gravitational forces. In addition, they have an unlimited compression ratio, due to the displacement of the piston on all lengths of the tube. ETNA piston accumulators are delivered pre-loaded with nitrogen and due to their tightness efficacy, additional reloading of nitrogen is not required during extended usage. These devices have standard fitting designs, but specific fittings can be requested. A nitrogen-loss detection device can be delivered upon request. For enhanced security, a back-up nitrogen-loss detection device can be provided as well.